Age as on 29.01.2016-Not more than 27 years. Selection criteria-Selection will be made on the basis of Graduate Aptitude Test in Engineering (GATE)-2016.In these recruitment ,GATE scores of 2016 will only be valid. Pay Scale-24900-3%-50500.Basic pay 24900 during one year training. Training-The selected candidates shall undergo one year training at various places. Service agreement bond-The candidates belonging to General and OBC categories will be required to execute a service agreement bond of 250000 and for candidates belonging to SC,ST,PWD categories agreement bond of Rs.125000. 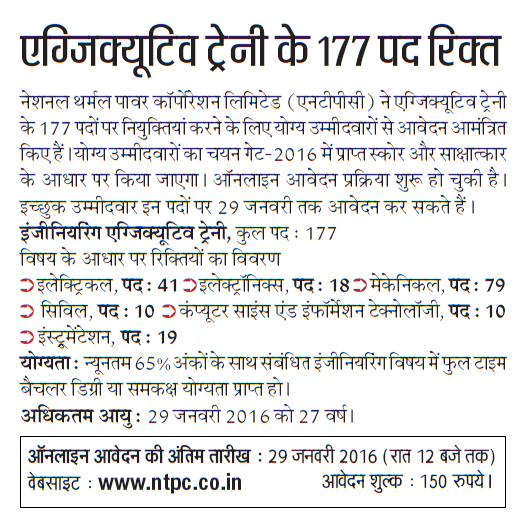 Last date of online registration-29.01.2016. Registration Fee-150 rupees for General and OBC candidates.No fee for SC/ST and Physically Handicapped candidates.Fee once paid will not be refunded under any circumstances. GATE-2016 online examination dates-30.01.2016 to 07.02.2016.